In our last e-news and Facebook News we held a competition for tickets for several events at Hay Festival. Here are the winners - congratulations all. See you there and dont miss the Wiggly Garden (stand 30) when you come. *Leo Hickman*: /Will Jellyfish Rule the World? Well done all, and thanks to everyone for entering. "Dear HeatherWe've given mention to Nettle Leaved Bellflower or Bats in the Belfry on numerous occasions and as it comes close to flowering, it is worth having a place as plant of the week. I have it in my garden positioned as one of the first wild flowers as you aproach the flower border, a good example for everyone on how a wild flower does not look out of place and can enhance the flower garden. Planted now for four years they have grown larger than any I've seen in the wild, each produces several flowering stems every year and are a favourite of bumble bees. Best Wishes Robert "
1: In the wild Bats in the Belfry is found in woods or hedgerows but in your garden full sun or partial shade is fine. 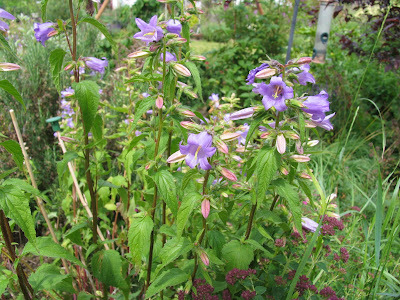 3: The bellflowers are violet blue and a bit hairy! We have several pairs of free tickets to events at Hay Festival. If you would like to go into our draw for tickets all you need to do is sign up for our e-newsletter Wiggl-enews which is packed full of offers and gossip and handy hints! 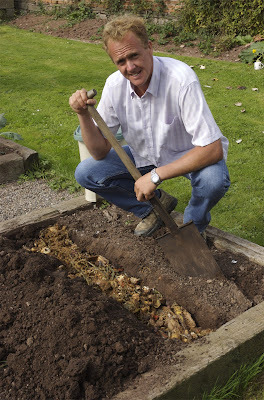 Terry Walton from Radio 2 will be in our garden on 27th May explaining how to Grow Your Own Credit Crunch Lunch! And if you tell us when you are coming we will furnish you with a wiggly button hole.